After the tour of Federal Ammunition plant in Anoka, I am convinced that fewer rounds of good ammo beat more bulk milsurp. The QC process at Federal is rather more impressive than the lack thereof that’s evident from the results I get from Tula and similar brands. This entry was posted in ammunition, humor, interesting people, rifle, weapon and tagged 9x19, keltec. Bookmark the permalink. I have read, in a book some time ago, about a felluh who went into countries to help them rebuild after we, or some other country had destroyed them. The lessons he gave were priceless. Your mindset, aswell as your actions must change as the circumstances change (from the countries downfall, to rebirth). I recall him saying, the most successfully used ammo that he could see, was the .22lr. A simple, distant warning shot over a gangs heads, would save you from spending many more rounds at close quarters, more times than not. And what about the unintended target hit by that “warning shot”? Warning shots over the heads of the bad guys are an ignorant practice taught to European cops. They are also clearly forbidden by Col. Cooper’s safety rules. Now if you had said “at the gang’s center of mass”, that would be a different matter. I’ve allocated about 10%-20% of ammo to be premium ammo, either hunting or self-defense ammo. The rest is made up of quality ammo brands & styles with good reliability, power and consistency. Some brands and/or styles of ammo aren’t worth buying because they are reduced “target” loads (i.e. any .38 Special 130 grain FMJ or Blaser Brass ammo). I always check the published velocity specs and reject “light” loaded ammo. This is just one reason Remington doesn’t make the grade (hard to find specs on their stuff). Always inspect the ammo you buy if practical. I’ve found deformed cases, inverted primers and even rounds with two bullets rammed into the case, all from well established American companies. And this was before the 2008 and later runs on ammo. For instance, you can purchase Fiocchi ammo, which I’ve found to be very good, for less than most other mainstream brands. The JHP technology on some of their ammo may be ’80s style, but it won’t matter to someone on the receiving end – especially if medical services aren’t readily available. PPU (Privi Partisan) is surprisingly good stuff too. Their .308 is consistent and groups nicely at long range. This is plainly a false dichotomy. 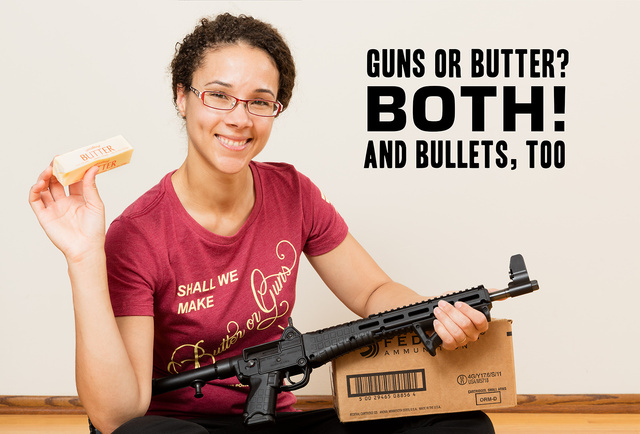 One may have a variable balance of guns and butter. Attempting to answer the question directly means accepting the question’s unstated premise, i.e. playing by the other mug’s rules. Since it’s another wretched election season, one can see this tactic on display all over the place. So I can have a butter-gun.